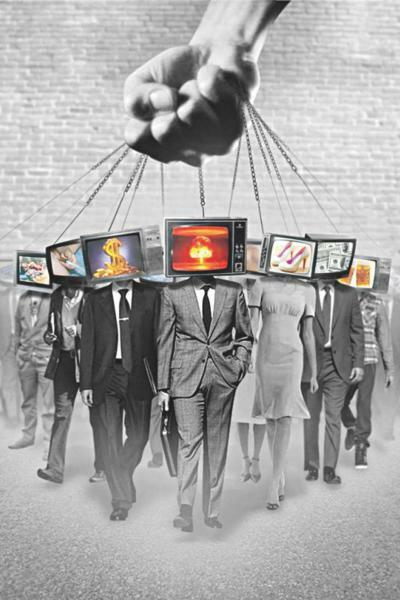 The U.S. mainstream media has an important role to play as the fourth estate. Sometimes it does an excellent job of informing the public on issues, particularly on many social issues. However, the mainstream media long ago abrogated its responsibility of accurately informing the public about U.S. foreign policy. Instead it has become a tool to advance the interests advocated by the U.S. establishment, particularly the goal to maintain U.S. hegemony. The numbers are different today, but Kennan’s point is still valid. Our leaders today try to advance U.S. banking and corporate interests by maintaining the obscene inequity Kennan identified. At the same time, our leaders strive to convince the U.S. and foreign populations that our interventions are done with good intentions, that is, in the name of advancing free-market democracy, human rights or self defending, that is, protecting the U.S. against foreign threats. The mainstream media seem to view its job as spinning these interventions to reinforce the government’s version. For example, many of us remember how the George W. Bush administration and our leading media misled the public over Iraq’s non-existent weapons of mass destruction. This was the government’s stated reason for attacking Iraq, but the control of Iraq’s large oil resources was one key reason for the attack. These false WMD allegations led to a major U.S. war crime and the devastation of Iraq. The media has since downplayed how this war crime led to the creation of ISIS and the continued slaughter of innocents in the Middle East. Lesser remembered is how the compromised mainstream media again cooperated with the Bush administration in attempting to generate support for an attack on Iran, another nation with huge oil resources. The same spurious claim of an active nuclear weapons program was put forth. Fortunately the U.S. intelligence community finally stood up for the truth and undercut support for an attack despite strong Israeli pressure for it. However this revelation of no active Iranian program has not prevented the continued attempt by many politicians, supported by several leading truth-challenged media pundits and the Israeli lobby and Saudi money, to sway U.S. public opinion to be in favor of an attack. In addition, in an additional effort to justify an attack on Iran, numerous U.S. political officials and pundits claim that Iran is the foremost state sponsor of terrorism. These shameful officials and pundits ignore Saudi Arabia and its support for terrorists. For example, a 2009 State Department cable stated: “Still, donors in Saudi Arabia constitute the most significant source of funding to Sunni terrorist groups worldwide.” I guess the out for Saudi Arabia is that it’s private donors providing the funding instead of the Saudi government. The media is also playing its role in Honduras and Venezuela. Since the U.S. currently backs the Honduran government, a government that came to power after a military coup in 2009, the media downplays horrific violations of international law and human rights there. For example, although the UN General Assembly, the Organization of American States and the European Union all condemned the 2009 coup, the U.S. wouldn’t officially declare it a coup and actually continued military aid. In addition, then Secretary of State Hillary Clinton kept the democratically elected President Manuel Zelaya from being returned to office. The result of the coup has been a large increase in violence and human rights abuses by this U.S. ally. Government actions include the killings of labor and environmental activists, peasants, reporters and opposition politicians. Crime has grown massively and many people have fled in fear of their lives. Poverty also increased dramatically while the wealthy profited. Now it appears that the current incumbent Honduran President, Juan Orlando Hernandez, stole the November 2017 presidential election. OAS representatives independently monitored the election and found widespread irregularities, doubted the validity of the outcome, and called for a new election. Unsurprisingly, the U.S. accepted the results from a election group dominated by Hernandez’s supporters that gave Hernandez the victory. Instead of providing in-depth coverage and challenging the U.S. position on Honduras since the 2009 coup, the media continued its focus on Venezuela. Hugo Chávez was elected President of Venezuela in 1998. He implemented social programs that greatly expanded access to food, housing, health care and education, benefiting a large majority of the population. Chávez used some of Venezuela’s vast oil and gas wealth to fund these expansions. This Chávez decision along with his warm relations with Cuba and unwillingness to support a number of U.S. positions caused him to be viewed as a threat to the U.S.-led neo-liberal system. In 2002, Venezuelan business leaders and some of the military staged a coup against Chávez. True to form, the U.S. failed to condemn the coup. Predictably, the New York Times editorialized in support of the coup. Chávez ‘s supporters and the military quickly rallied and forced the restoration of Chávez and democracy. After the failed coup, the U.S. resorted to economic and political warfare to undercut Venezuelan democracy just as it had done in Chile against the democratically-elected Salvador Allende government. It has been almost 16 years since the failed coup against Chávez and the U.S. funded opposition still hasn’t ousted the government. U.S. Secretary of State Tillerson recently said a military coup is possible, although adding the U.S. isn’t specifically advocating for regime change. Instead, he hoped Nicolas Maduro, the democratically elected successor to Chávez, would voluntarily step down. Note that Venezuela, falsely labeled a dictatorship, will hold another presidential election this April. I hope there will not be another coup attempt, abetted by neighboring foreign forces and the U.S., before then. All of this discussion ignores the mainstream media’s two greatest successes, that is, avoiding any in-depth consideration of violations of international law and human rights by Israel and the U.S. itself. The U.S. mainstream media portrays Israel as the victim of Palestinian terrorism while ignoring Israeli occupation of Palestinian land and continuing widespread oppression and state terrorism against Palestinians. The media also ignores the elephant in the room, U.S. crimes. As a result of media’s slavish complicity, most of the U.S. public has little idea about how terribly illegal, unjust and violent U.S. foreign policy really is. Clearly the U.S. is hypocritical in its foreign policy positions and the mainstream media is generally polite enough not to point this out.